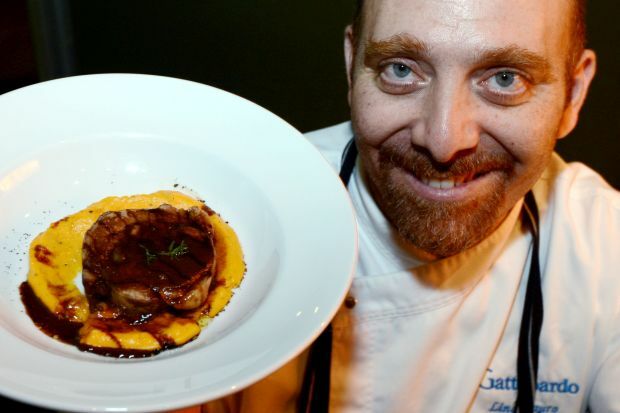 DINERS at Garibaldi in Bangsar Village were recently treated to a one-night special menu devised by visiting chef Lino Sauro from their sister restaurant in Singapore. Self-taught Sauro now runs his own restaurant, Gattopardo, a joint venture with the Garibaldi in Singapore. Sauro specialises in Mediterranean cuisine, especially Sicilian dishes. “The inspiration for my cooking comes from various influences, but the basis for most of the dishes was from my own island’s cuisine. 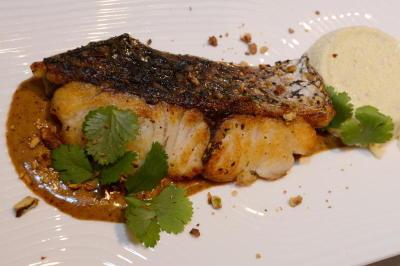 Of the sea: The fifth course consisted of broiled sea bass filet, accompanied by Bronte pistachio sauce and a savoury-bland cauliflower flan. “I was born in a municipality around the mountainous area where my dad was a farmer,” said Sauro. This background meant that Sauro grew up using fresh ingredients, and this developed into a healthy skepticism of “processed” ingredients. Sicilian cuisine demonstrates influences from foreign cultures such as Arabic, Norman-French, Spanish and Greek, and the night’s menu reflected this, with plenty of ingredients from southern Italy and Sicily such as blood oranges, saffron, cinnamon, sardines and liberal use of olive oil. “Sicilian cuisine focuses a lot on seafood compared to other Italian cuisine which uses a lot of beef or meats,” he added. Guests had the choice of pairing their seven-course menu with selected Sicilian wines for each course (RM350++), or just going with the food alone (RM250++). Savoury delight: Topped with melting bone marrow and butter, diners areto mix the dish together to spread the rich marrow evenly. To start off, the kitchens produced a fennel salad topped with thin slivers of blood orange zest, sprinkled with flaming salt flakes (harvested from Trapani, Sicily). As a starter, the taste was subtle, with the orange zest producing a slight tangy flavour. This was followed by the hearty amberjack belly tartar sprinkled with creamy herring roe and sea urchin. The dish is best described as decadent. The rich taste of the fish belly was complemented by the briny flavours of the sea urchin and herring roe. For added flavor, Sauro lightly sprinkled bell pepper powder and drizzled orange and parlsey sauce around the dish to complement the raw fish. Sardines are pretty much a Sicilian national ingredient according to Sauro, and his take on pasta alla sarde was bucatini, a “holey” semolina spaghetti with ground-up sardines, wild fennel, saffron and pine nuts. To contrast the savoury taste, Sauro added raisins and fried breadcrumbs for an added crunch. This was followed by a risoni dish, with braised octopus and bone marrow. Presented with the bone marrow (mixed with butter) melting on top, one was supposed to mix up the dish so the octopus chunks and pasta were spread with the meaty taste of the marrow. For flavour, Sauro had combined red wine, verjuice, tomato paste and octopus stock and cooked it to a reduction. This being a Sicilian menu, fish also featured heavily, with a broiled sea bass fillet, accompanied by a cauliflower flan and a sauce made from Bronte pistachios which are native to Sicily. The sauce was savoury, flavourful and complemented both the bland sweetness of the fillet as well as the flan. One could get the cauliflower aroma, where according to Sauro, the vegetables had been blended and mixed with egg to form the savoury custard. The sixth dish consisted of slow-braised lamb (cooked for 20 hours prior to dinner service), accompanied by rosemary-flavoured sweet potatoes and sweet sauce made from the carob bean. The sauce had been combined from the lamb drippings, red wine, verjuice and carob powder, and reduced to be drizzled around the bland sweet potato mash. As a prelude to dessert, Sauro made his very Sicilian Granita al Caffe con Panna, which was expresso coffee-flavoured ice shavings, topped off with a generous amount of cream. After all the Italian names for the previous six main dishes, the dessert was incongrously named Leave The Gun and Take the Cannoli, the classic line uttered by mafioso Pete Clemenza in the movie classic The Godfather. “Cannoli is a classic Sicilian dessert, and The Godfather was about Sicilians. 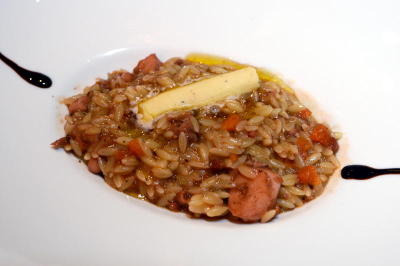 So Clemenza’s line was appropriate for the dish,” said Sauro. The cannoli itself is an expresso-infused wafer, filled with ricotta cream. Accompanied by cold Amedei chocolate mousse, the ricotta cream was not too sweet as traditionally made in Italy. “I discovered that normal cannoli filling was too sweet for Singaporeans and Malaysians, so this one is less so, but still enough to satisfy sweet-toothed diners,” he said. Sauro also explained that while this was a one-night event, there would be other “crossover” events in the future and he would be more than happy to return to delight Malaysian palates again.